Tenkara fly fishing has been simmering in the background for a few years now, but if the first few months are any indication, 2012 is shaping up to be “The Year of Tenkara.” Tenkara has been showing up a lot lately; in the fly fishing forums, on fly fishing blogs and in mainstream fly-fishing media. This is also the year that Tenkara USA, the first US tenkara company, has made or will make its debut at all the major fly fishing shows. There is a definite buzz in the air. So what’s it all about? What is this thing called tenkara? And why should I be interested? To answer these questions I went to the source, Daniel Galhardo, president and founder of Tenkara USA. Tenkara USA introduced the first domestically available tenkara rods to the United States market in 2009. Though a few tenkara fishers existed in the US prior to that, the sudden surge of interest started with Galhardo and his company. Mr. Katsutoshi Amano, perhaps Japan's most experienced tenkara master, fishes a long tenkara line. Anthony, thank you very much for the continued interest in tenkara and the opportunity to cover it in more detail. Tenkara is the Japanese method of fly-fishing that uses only a rod, line and fly—no reel. It is primarily used for (and is ideal for) mountain streams. 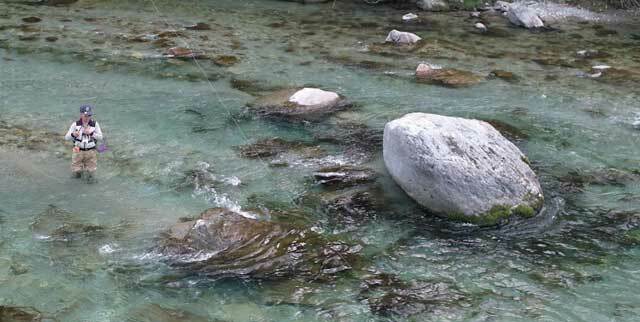 Tenkara originated in the hands of commercial anglers in the mountain streams of Japan. It most likely developed independent of outside influence, when the mountain folk of Japan realized they could imitate an insect with feathers and silk, that they could cast the weightless fly with horsehair lines or silk lines, and that the abundant bamboo where they lived made for perfect fly fishing rods. What does your perfect tenkara stream look like? A verdant mountain stream with lots of features, mossy rocks, clear water, currents and some white water, bends I can’t see beyond and must walk around to reveal a brand new stream within a stream, and pockets where I can spend a brief moment and move on to the next one. How do Japanese tenkara practitioners view tenkara in the US? I get a sense there is great pride in the growing adoption of a Japanese cultural element here. I have spent time with some of the older masters in Japan and asked them directly how they feel; they unanimously respond that they think it’s wonderful and show their pleasure by sharing what they know with me so I can continue bringing more traditional tenkara here. Tell us a little about yourself. What’s your story? 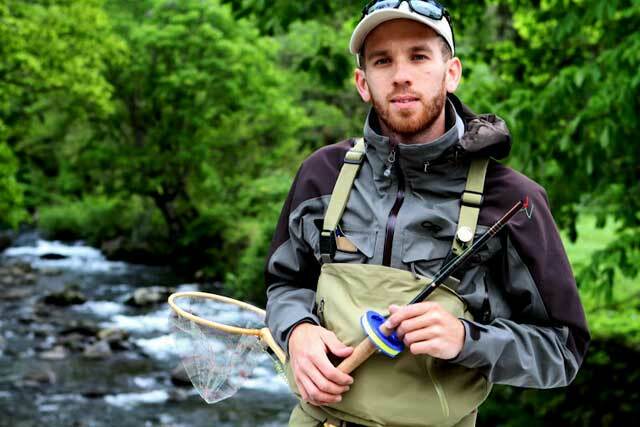 It’s not everyday that a person walks away from a career to start a company that manufactures and sells fishing rods for a little-known Japanese fly fishing style. When were you first exposed to tenkara and what led from that moment to the founding of Tenkara USA? Oh, this question could have a very long answer! I believe everything I have ever experienced in my life, been interested in, and strived for has led me to discover tenkara and become the first person to introduce it outside of Japan. For the last couple of months I have been concentrating on finalizing my book on tenkara, which has been in the works for a couple of years now. I’m probably making the mistake of assuming I have an interesting story—the biography portion of the book is currently 60 pages long, and I’m only 29. But, there are a lot of things that led to the eventual founding of Tenkara USA. The short version is that I fell in love with mountain stream fly-fishing and with a wife who is Japanese American. In planning my first trip to Japan, I noticed the abundance of mountains and mountain streams in the country. 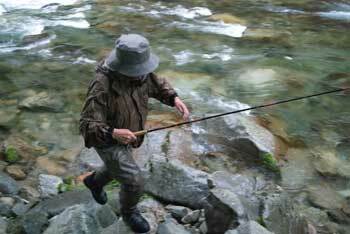 I then realized that in the US we never hear about fly fishing historically being practiced in Japan. But in a country with so much water there had to be a wonderful fly-fishing tradition, so I started searching for information on the history of fly fishing in Japan. Originally I was expecting to find some cool stuff that may have developed after [western] fly fishing was introduced in the country—some neat looking reels perhaps. Instead, I discovered they had their own method of fly fishing that did not use reels. In my first visit to Japan I got to see the equipment used. Handling the rods brought me back to my childhood days of using telescopic rods for bait fishing. Tenkara mixed perfectly the simplicity of my childhood fishing with the elegance of fly fishing that had captivated me some 13 years earlier. When I returned to the US, I started looking for more information on tenkara and could find very little information in English. The more I went tenkara fishing the more I realized it was a great method of fishing. Many people I talked to proclaimed to love fishing in mountain streams, or small streams, and tenkara was developed specifically for that, so it baffled me that no one talked about it here. It also seemed to be designed with backpackers in mind as the modern rods are very compact. I needed to show it to people. I could have written ten books on the method, but if I couldn’t get the rods in the hands of people, no one would understand what it was. I had studied international business and finance in college, with an emphasis in entrepreneurship. At the time I was working with Wells Fargo’s foreign exchange online group and in a clear career path in foreign currency and international payments. This was the first year of the recession, and despite working at a bank I was working at one of its most stable groups, and had a very, very secure career. Nevertheless, at that point I decided I should introduce tenkara to the US. So I created Tenkara USA. I left my job a month before Tenkara USA went “live,” and have been at it full-time ever since. Tell us a little about the design and construction of tenkara rods. What it is about them that makes them so different from western rods? The most apparent difference between tenkara and western fly rods is the length. 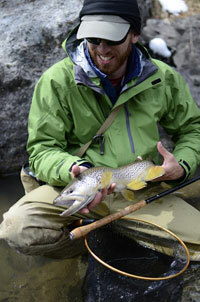 Whereas western rods are, on average, 9-ft long, tenkara rods average 12-ft long and range from 10-ft to 14-ft 7in. This extra length allows the angler to keep the entire line off of the water and on the other side of currents. It also gives a lot of direct control over the fly. Tenkara rods are designed to effectively cast super-light lines. In fact, the lighter the line one can cast the better, so that the line can then be kept entirely off the water even at considerable distances. For example, with a 13-ft long rod I can cast a 30-ft line and 4 feet of tippet; this will give me a reach of approximately 45 feet. The entire line can stay stretched out, off the water, with only tippet and fly in the water. The ability to cast such a light line is one of the main functional differences between the rods. Because the rods are not designed to withstand the heavy weight of a western fly line, and instead are designed to cast a very light line, this translates into a rod that bends a great deal even under small fish and which can in turn protect light tippet for larger fish (e.g. 20-inchers). Like western rods, tenkara rods are made to be comfortably cast all day. They feature a cork handle for gripping and a taper designed to cast the very light line. Some people have compared modern tenkara rods with telescopic crappie rods. This is equivalent to comparing a spin-fishing rod with a western fly rod. The taper and flex of tenkara rods is designed to cast a line forward, not a heavy weight at the end of the line. And tenkara rods are designed to be as light as possible for comfortable casting and use. One of the most common misconceptions about tenkara seems to be that there is no casting involved and that tenkara is somehow equivalent to “dapping.” What would say to clear this up? This really is the biggest misconception out there, and that’s part of my job to educate people on what tenkara is and what it is not. The best way really is for people to watch videos, come to a demonstration or try it for themselves. It instantly becomes clear that tenkara is not dapping the moment one watches a line being cast with a tenkara rod. Most people are surprised the moment the line is cast forward, especially with longer lines. 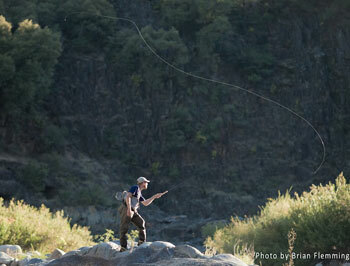 Videographer Brian Flemming (of www.learntenkara.com) recently took a great photo of me casting a long line that we hope will show folks that tenkara is not just dapping. It is very difficult to get a good photo of tenkara casting because the lines are so thin and light (to put into perspective, a tenkara line is as light as 1/3 the weight of a 000-wt western fly line). The light lines allow for great presentations, and for the line to be kept off the water at great distances, but they are difficult to capture on film or in videos. Could you tell us the difference between the tenkara fly-fishing method and simply using a tenkara rod as tool for western-style fishing? 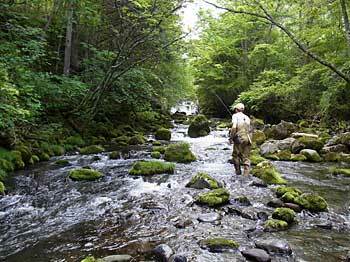 Tenkara is a fascinating and complete method. It has its own history, equipment, flies and techniques. It was developed and refined by people who depended on catching fish for a living. The techniques in particular make tenkara stand out as its own method, and that is what I like to focus on. There is a lot we can learn from those original anglers, and instead of using the tenkara rod as a tool to practice western fly-fishing, I like to focus on showing people the diversity of fishing techniques developed by tenkara anglers. For example, counter to common western fly-fishing practices, the tenkara angler does not change fly patterns. Instead, he focuses on varying his fishing techniques to entice fish by manipulating the fly, dragging it, or sinking it using currents. On the other hand, tenkara can also be seen as a tool where the rod and fixed-length line can be used very effectively with western flies and techniques. The rod is a great tool for nymph fishing (e.g. the currently popular Czech-nymphing techniques), where the tight line can provide for great sensitivity and control over the fly. Tenkara can also be used very effectively with dry flies, where the long rod and very light line provide for drifts with no drag at all. Or tenkara can be seen as just an ultra-portable fly fishing setup, ideal for backpacking. I prefer to focus on introducing the complete method, honoring its history and making sure we don’t throw away hundreds of years of learned techniques. But, I also understand people will do their own thing and deviate from how tenkara is practiced in Japan. There is absolutely nothing wrong with using tenkara as a tool, but I want to provide a starting place for people to find their own tenkara. There seems to be some resistance when it comes to tenkara. 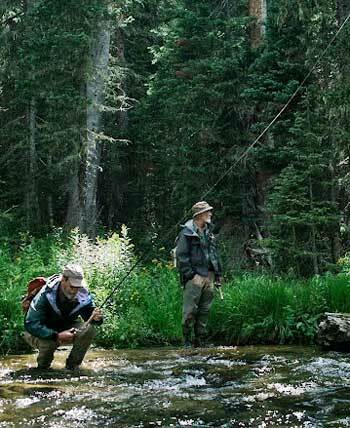 For example, most folks seem to have no problem accepting other new fly-fishing techniques such as European-nymphing, but tenkara seems (to me at least) to be met with more skepticism. Do you see that and if so why do you think that is? It is a very strange phenomenon. For some people the use of a reel defines fly-fishing. It baffles many anglers that fly fishing can be done without a reel, despite the fact that western fly fishing started without a reel. Charles Cotton and Dame Juliana Berners did not use a reel. In some techniques, such as European nymphing, the reel serves little purpose beyond storing line. One does not need a reel to cast and to fish. It’s interesting to note that while many adults are puzzled by the question “How do you land a fish without a reel?” every time I have given a child a tenkara rod and asked them to show me how they would land a fish, or asked them to cast the fly, their intuition just takes over and they know instantly that fly fishing can indeed be done without a reel, they know how to land a fish, and they even figure out how to cast the fly. In your experience do tenkara anglers seem to be mostly from the ranks of experienced western fly anglers, or are they coming into fly fishing for the first time through tenkara? It is actually evenly split between the two ends of the spectrum: novices who have been intimidated by the perceived complexity in fly fishing, and some of the most experienced anglers in the country who see in tenkara a new challenge and realize fly fishing can be simpler and want to do more with less. We have introduced a lot of backpackers who always thought fly fishing would be fun in their outing but didn’t bother trying it before. And some well-known anglers like Craig Mathews, Dave Hughes, John Gierach, Ralph and Lisa Cutter and Yvon Chouinard have taken it up as well. An angler says, “I catch fish with my western gear, why should I try Tenkara?” What do you tell him or her? What are the advantages? To some people it may be the portable aspect of the equipment and maybe the minimalist nature of the method. Backpackers who already catch fish with their western gear love it for how easy to pack it is. Tenkara is not for everyone, but the people who will enjoy it often realize it the moment they read about it. Anything new in the works for Daniel Galhardo or Tenkara USA? There is always something new going on. I thrive on change and taking on new initiatives. We attended our first Fly Fishing Shows this year and were very welcomed by the fly fishing community in those shows. That was a great way to start the year. My biggest focus at the moment is finishing my book on tenkara, which will be done this year. We are also planning our second Tenkara Summit, which will be held in July in Salt Lake City; the first Tenkara Summit was a great event in West Yellowstone last August and we had over 120 participants. We expect over 200 people to attend it this year. And there are a couple of new products we’re making available, including a new tenkara line we are just about to release. Lastly, is there anything more about tenkara that you’d like to get out there to the angling community? There is some skepticism and misperception about tenkara, all of which is very natural with something so “foreign” being introduced. But tenkara is nothing new; it has been done for a long time, and has a thriving community in Japan, and also now here in the US. I would encourage everyone to give it a try. We make it easy by offering a 60-day return policy so people can speak from actual experience. As the first person to introduce the method outside of Japan I take great pride introducing it and want people to give it a fair try. Thank you very much for the opportunity to share some of my views and my story.